simple interest calculator is an online interest calculation tool to calculate the time value of money to know how much interest will be earned or charged on a principal sum at certain interest rate for particular period of time. 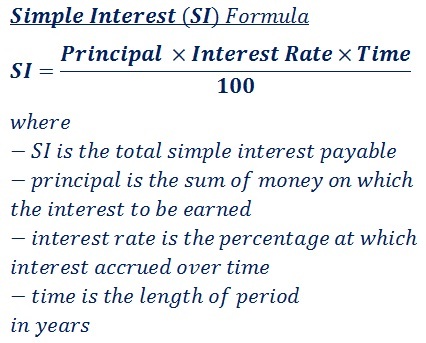 Unlike compound interest calculation, the principal sum remains constant and will not be changed due to interest through out the entire period for which the principal sum is borrowed. When money is borrowed or lended at simple interest, the interest will be charged on the original amount of money, and not on any interest that it has earned. The interest on principal remains same for every month or every year and it is calculated from the principal amount P, simple interest rate R in percentage per year and length of the time T in years. It's often abbreviated as SI and is the most basic type of interest. step 1: multiply the given principal sum P, interest rate R in percentage & time period in years together. step 2: for yearly interest payable, divide the result of above multiplication (P x R x T) by 100 gives the simple interest. step 3: divide the simple interest by 12 for 1 year or 24 months for 2 years and so on, provides the monthly payable interest amount. Calculate the yearly & monthly simple interest payable for the principal sum 1000 USD borrowed at 6% of interest rate for the time period of 1 year. By using this simple interest calculator users may calculate the SI in any unit of World currencies like USD, GBP, AUD, JPY, INR, NZD, CHF etc. To calculate the SI in the desired currency, select the currency from the world currencies drop down menu provided just above the calculator. 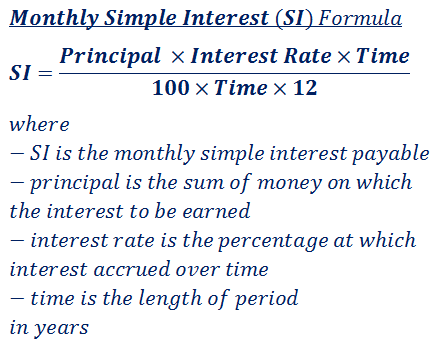 Simple interest is the basic interest calculation method to calculate the time value of money in the context of finance. The formulas, step by step calculation & solved example problem may used to understand & perform such calculation manually, however, when it comes to online for quick calculations, this simple interest calculator may helps the user to perform & verify such calculations as quick & easy as possible.